It's really satisfying when you can make a meal using stuff you already have lying around. I had some pizza dough left from a failed pizza party, tomatoes, red onion and red pepper left over from an Israeli salad I made the other day, and some ricotta I had in the fridge. 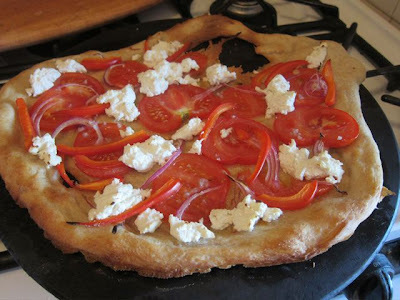 It was a great combo: the tomatoes were sweet after being cooked, the onions and peppers had some zing and the ricotta was creamy. I'm proud of this one and ate the whole thing by myself.